This article is a short summary of Wario Land 4. 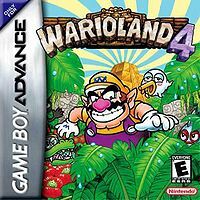 Wario Land 4 is a video game released for the Game Boy Advance in 2001. It is the fourth game of the Wario Land series. While it has no direct connection to its predecessors, it shares many gameplay elements with the previous two installments of the series, Wario Land II and Wario Land 3. It notably diverges from them in removing Wario's immortality, however, and also utilizes a noticeably different and more detailed art style than the previous games. "Wario's back for more...and more...and MORE! Hey! You! Yeah, you! Listen up when Wario's talking to you! I just read about this legendary Pyramid of Gold, and you're gonna help me go explore it. There's lots of treasure in there for the taking, and I want it all. I'm sure there are gonna be all kinds of weird enemies and big, bad bosses in there, so if you don't think you can hack it, put the game down now. I don't want any losers making me jump into bottomless pits, you hear me?" This page was last edited on 3 April 2012, at 16:41.